The longest route to Australia is the United Airlines Houston to Sydney clocking in at 17 hours. So what's the best tactic to dealing with the long fight time? 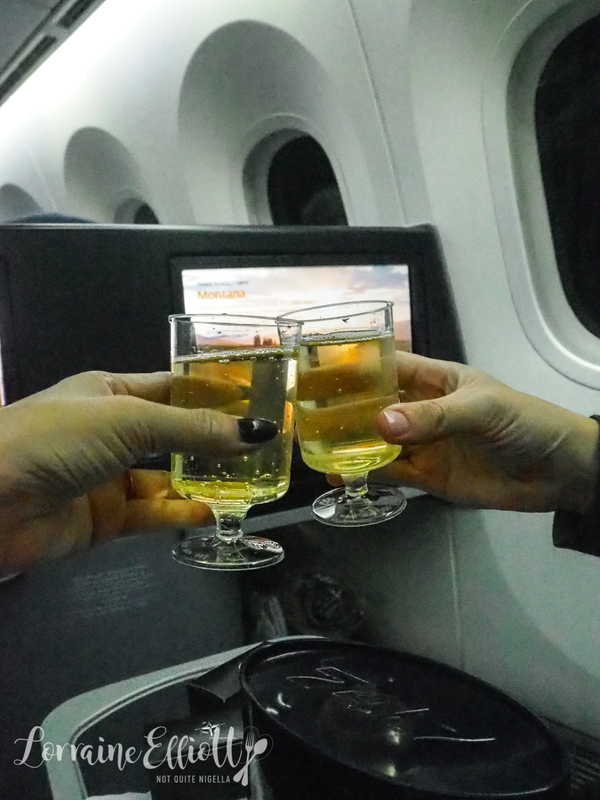 Sit with a friend and make use of United Airlines' pyjamas, in flight wifi and wine flights! United Airlines has five lounges at Houston airport located at different terminals. As we've been out and about since noon and caught another flight and been given a Houston Airport tour, a shower would be just heavenly. Alas, the United lounge does not have shower facilities. Instead we take advantage of the wifi and the chance to plug in our devices before we are called to the gate. Although fellow writer Kristie and I had only met 9 days before, we had struck up a friendship based on similar attributes of silly, saucy humour and our love of the ridiculous. We were sitting in different rows but wanted to sit together. I offered my window seat to her aisle seat mate and he happily acquiesced. The crew on this return leg is more subdued than the lively crew on the inaugural Sydney to Houston flight but that's understandable. Our flight attendant doesn't introduce herself in the way that the others did and she's polite but a bit removed. She hands us our hot towels and we play with our amenity kits. 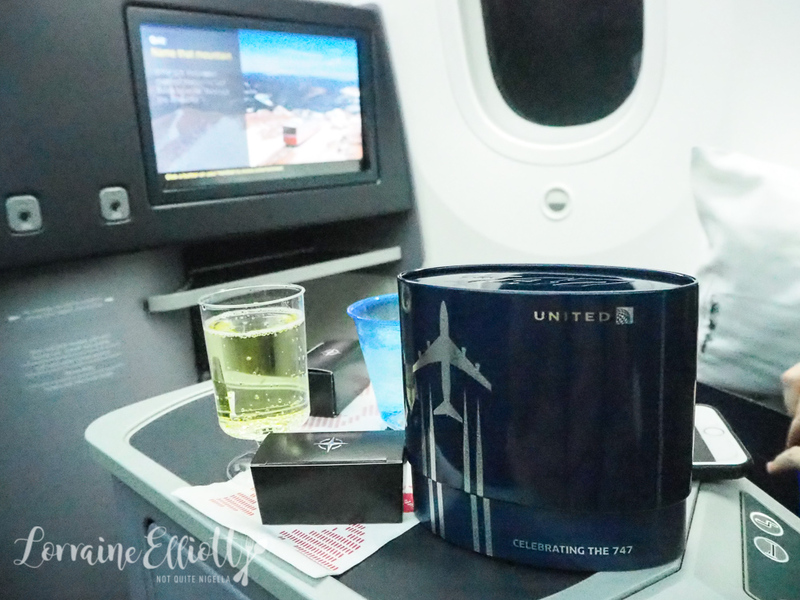 The United 747 amenity kit comes in an oval metal container. It's comprehensive with everything you might want but my only criticism would be that it can be hard to remove the lid at times. Personally, I also prefer ones that can be reused as cosmetic or camera bags. We are offered champagne and chocolates-the chocolates are filled with a strawberry fondant filling and a caramel filling. 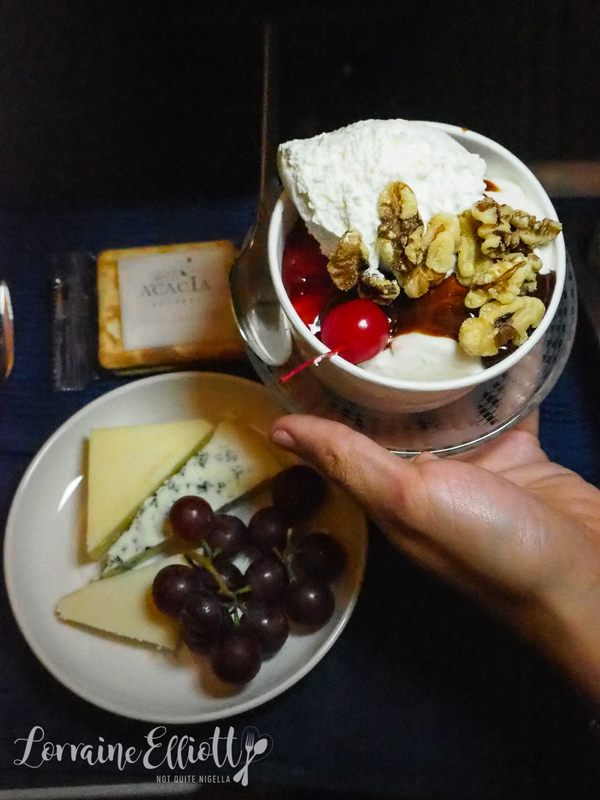 The flight attendant asks us if we would like any of the sleep amenities and we say yes to them all. On offer is a set of 100% cotton pyjamas and fleece lined slippers (to take with you), Saks Fifth Avenue mattress cushion and a cooling gel memory pillow (both for the flight). She brings all of them except for the pillow. I get changed in pyjamas in the bathroom (tip: the business class bathroom on the left in the middle of the two business class cabins is double the size of others). It's time for drinks and the drinks trolley ambles down the aisle. 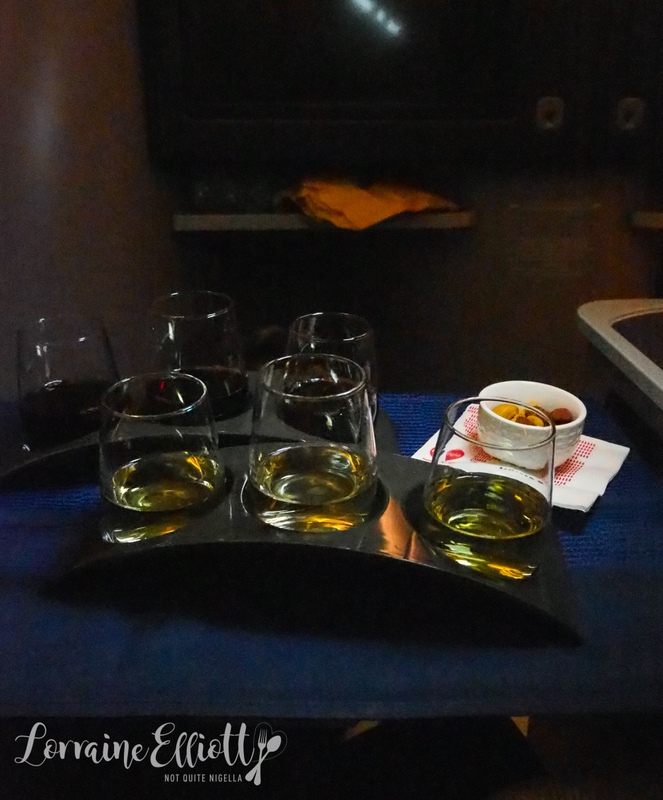 There is a wine flight offered but you do have to ask for it as the flight attendants tend to offer a single glass of wine or a drink. We order the red and white wine flights and share these. The white wine is fantastic as is the chardonnay and we also really like one of the reds but it is hard to tell which one it is as the menu only details two of them. The wine list is curated by Master Sommelier Doug Frost. 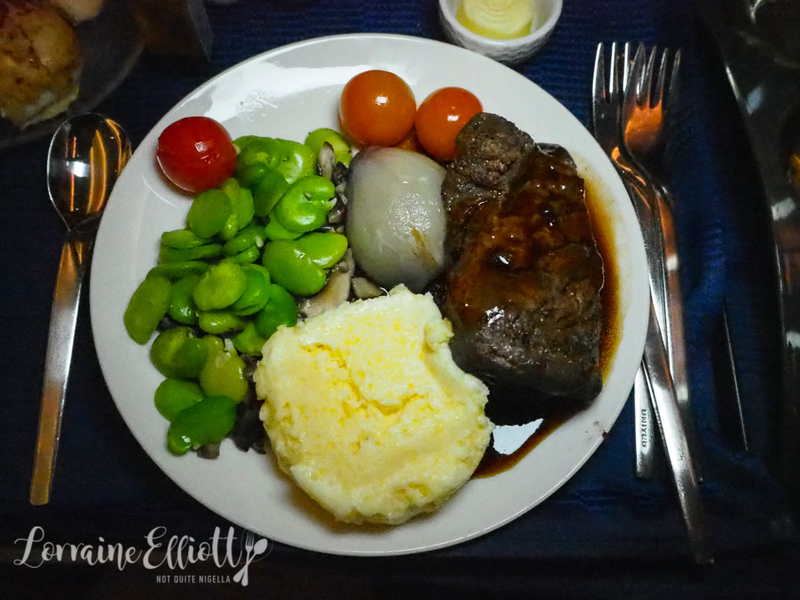 Earlier before takeoff they had asked us to choose the main meal or entree. The rest of the menu automatically comes out to the passengers. 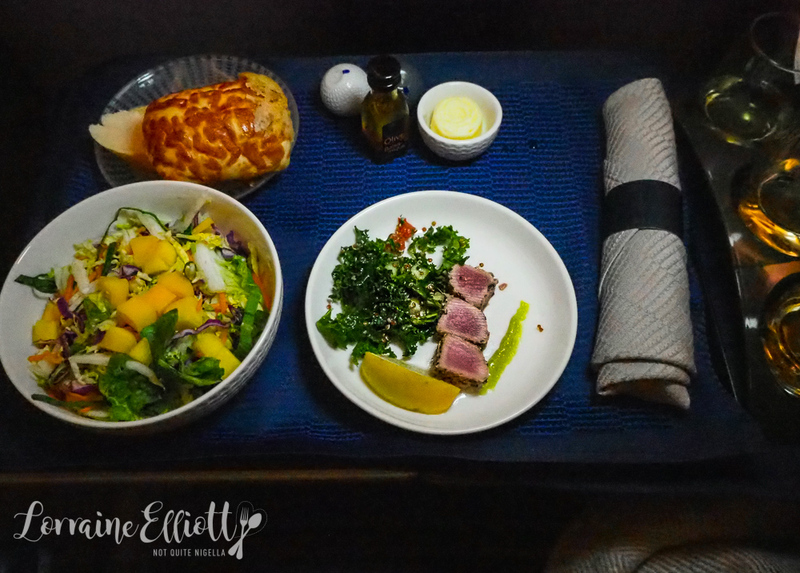 I start with the chilled appetiser which is seared tuna pieces with kale salad with apple and red quinoa and a streak of wasabi mayonnaise. The salad is shredded cabbage, boy choy, carrot and diced mango. To the side is an olive oil and balsamic dressing. There's also cheese bread and a garlic bread and a butter. Kristie and I are sharing the mains so I try her seared beef short rib bordelaise served with grits, fava beans, shiitake mushroom, cherry tomato and half a shallot. The beef is very tender and this is actually a very tasty main which is also substantial. 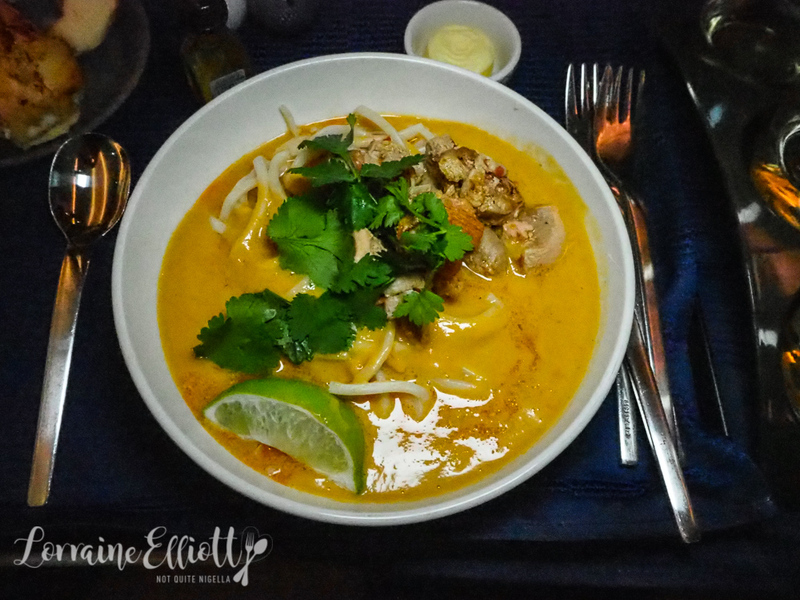 I also try the spicy chicken which is a Thai style coconut and ginger broth with udon noodles and plenty of sourness from the lime. The lime is a touch strong but I did miss Asian flavours while I was in Texas so this is welcome and soup is always wonderful to have on a flight. We are offered cheese or a sundae and we decide to share this too because quite honestly we didn't need more food but we had to try it because research and all. The cheese selection is a cheddar, blue and brie. I eat the cheese by itself as the crackers aren't very crisp. The sundae trolley rolls around and I decide to go with the recommendation from my former seat mate and United in fight supervisor Craig. He had a chocolate and strawberry sundae with whipped cream, nuts and cherries. It's not bad but I have to say that I preferred the caramel and almond one to this one as it had chunks of walnuts that were too large and hot fudge sauce just isn't my sort of thing (sorry, can we still be friends?). Kristie and I have now talked for about three hours over dinner and we both decide that it is time to brush our teeth and go to bed. We make our beds with the bedding provided and I would love an extra pillow as I put one between my legs (is that weird?). I ask a flight attendant walking past for a pillow and she is actually very dismissive saying, "I doubt we have one but I'll look," (in the sort of tone that you hear a lot in economy but not so much in business class) and she never comes back. I take a sleeping pill and fall asleep for 8 hours sleeping well although when there is turbulence there is often announcements to put seatbelts on and the television screen switches on brightly. It is also very easy to knock the side console to turn on the television accidentally. Bizarrely, at around the same time, Kristie and I both wake up after a decent night's sleep. 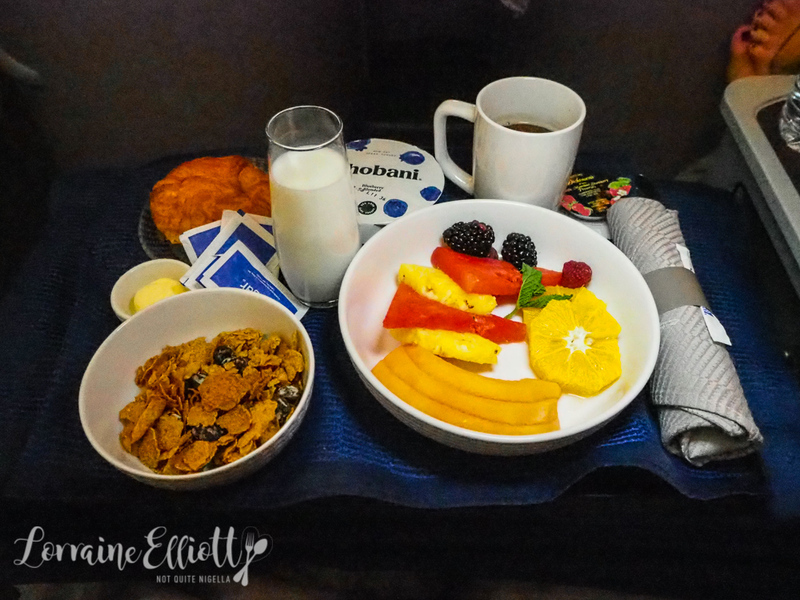 The lights in the cabin get brighter gradually and we are served breakfast. The South Western omelet is filled with melted Pepper Jack cheese with a topping of black beans corn and roasted red peppers. To the side are two chicken sausages and diced breakfast potatoes. It's actually quite tasty and doesn't have that eggy aroma to it that I find a bit jarring on planes early in the morning. Because I was eating for two (not pregnant, just greedy) I have to admit that I devoured the fruit plate as it was full of super sweet fruit. 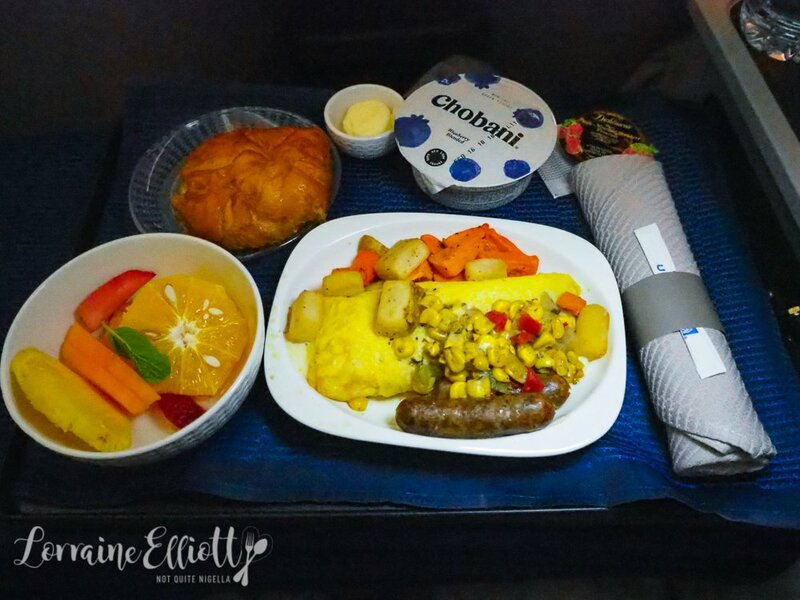 The breakfast also came with a croissant, yogurt, butter, jam and cereal with milk. And I'm glad that I was able to get a cup of Earl Grey tea over just plain black tea. And when I ask for sugar with my tea our flight attendant (who really didn't seem to like us very much) gives me five packets which makes Kristie and I burst into laughter. We've got just enough time to get dressed before we arrive home. So tell me Dear Reader, what would you order on your sundae out of hot fudge, caramel, strawberry toppings? 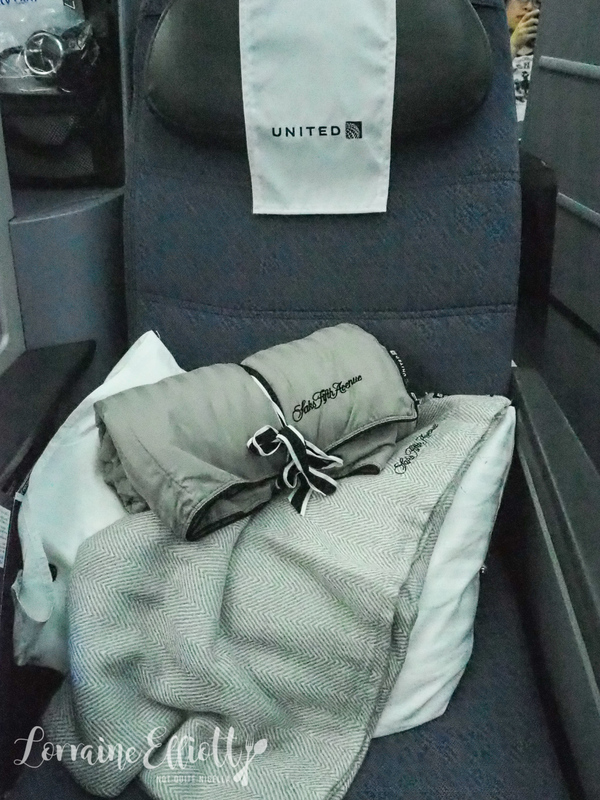 What is the longest that you've slept on a flight? NQN travelled as a guest of United Airlines but all opinions remain her own. travelThe Inaugural United Airlines Sydney To Houston Flight! 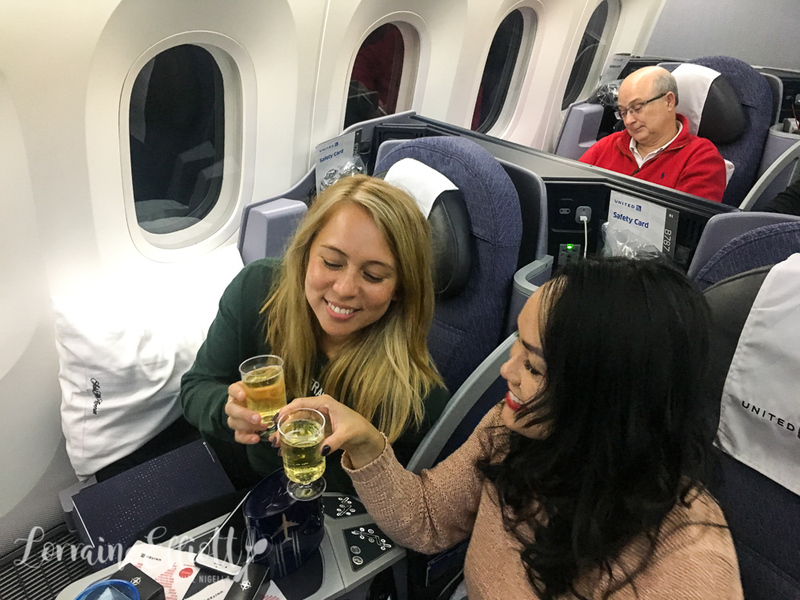 travelFlight Review: How To Spend Time On The Longest Plane Trip in The World! travel The Inaugural United Airlines Sydney To Houston Flight! 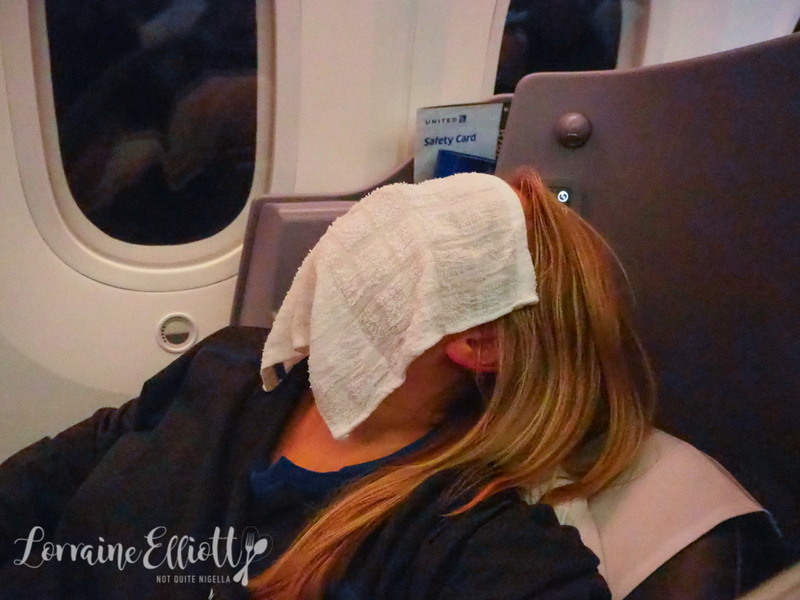 travel Flight Review: How To Spend Time On The Longest Plane Trip in The World!